Hear from the soon-to-be newest members of the Oklahoma City Council. 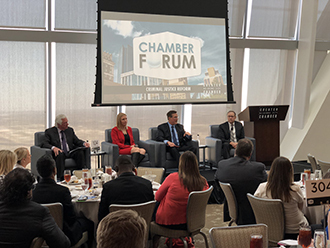 At the March Chamber Forum, hear from the soon-to-be newest members of the Oklahoma City Council. Councilman-elect James Cooper, Ward 2, Councilwoman-elect JoBeth Hamon, Ward 6, and Nikki Nice, Ward 7 will be on hand to discuss their priorities and their vision for the future of Oklahoma City. Online registration is now closed. To register or for more information, email register@okcchamber.com or call 405-297-8921.